LAKE POWELL — Ninety area students and teachers from the Lake Powell School in Bullfrog and Bluff Elementary School in Bluff visited Rainbow Bridge National Monument Nov. 9. The National Park Service’s Bridging the Gap Program and the generosity of Lake Powell Resorts and Marinas made the trip possible. “We are honored to connect so many children, many of them Native American, to Rainbow Bridge,” park Superintendent William Shott said. Rainbow Bridge is one of the largest natural stone bridges in the world, but is difficult to access by land. Most visitors reach the site by boat on Lake Powell. Lake Powell Resorts and Marinas provided a free, round-trip boat ride for the students and staff at the schools and supplied ninety sack lunches. “Lake Powell Resorts and Marinas is very proud of our partnerships in the local communities,” Captain Tony Anderson, general manager of marina operations, said. “Members of our management team first saw Rainbow Bridge on school field trips taken on Lake Powell Boat Tours. 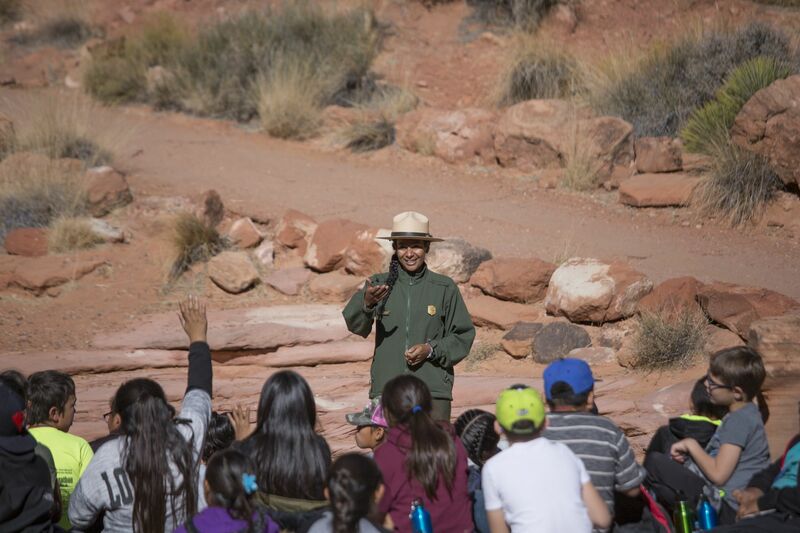 The trip was part of the National Park Service effort to connect local elementary school students with Rainbow Bridge, a geological formation of significant cultural, historical and spiritual significance to many native peoples living in the area. Bridging the Gap provides a series of educational programs that incorporate hands-on science and understanding of the NPS mission into the 4th grade curriculum. This year the NPS Every Kid in the Park Program provided increased funding, so students from Cameron, Gap, Page and Navajo Mountain will be able to participate. Rainbow Bridge National Monument was established before the NPS in 1910. In April 2017, the NPS designated Rainbow Bridge a Traditional Cultural Property on the National Register of Historic Places, recognizing the site’s historic and ongoing cultural significance to at least six American Indian tribes. The 290-foot-tall, sandstone Rainbow Bridge has been associated with ancient traditions of the Hopi, Kaibab Paiute, Navajo, San Juan Southern Paiute, Ute Mountain Ute, and Zuni people. Spanning 275 feet, with thickness varying from 33 to 42 feet, Rainbow Bridge is one of the largest known stone bridges in the world.